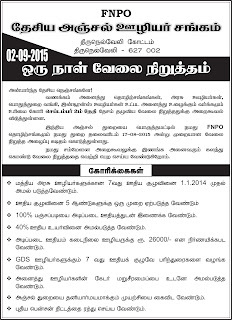 2015-08-23 ~ National Association of Postal Employees, Tirunelveli Division. Govt assured on Bonus enhancement, wage formula. The Second meeting of Inter-Ministerial Committee (IMC) continued discussion on 12 Demands Charter of Trade Unions for the second day here today in continuation of discussions held yesterday. The Committee comprises Shri Arun Jaitley, Finance Minister, Shri Bandaru Dattatreya, MoS(IC) Labour and Employment, Shri Dharmendra Pradhan, MOS(IC) Petroleum and Natural Gas, Shri Jitendra Singh, MoS DOPT, and Shri Piyush Goel, MoS (IC),Power. During the discussions Trade Unions expressed concern and asked for clarifications on their demands. Addressing their concerns and expectations, the Finance Minister explained policies on which the Government is working and assured that the Government is committed to welfare of labour. Underlining the importance of role of Trade Unions, Shri Jaitely assured the Central Trade Unions that all labour laws reforms will be done with due discussions and tripartite consultations. In view of the discussions held in conducive and cordial atmosphere, the IMC appealed to Trade Unions to reconsider the proposed call for strike on 2nd September, 2015.The Trade Unions have agreed to consider the appeal. 1. Appropriate legislation for making formula based minimum wages mandatory and applicable to all employees across the country. 3. The Government is expanding the coverage of social security and working out ways to include construction workers, Aanganwari workers ,ASHA workers and Mid Day Meal workers. 4. Regarding contract workers the Government assured that they will be guaranteed minimum wages. Moreover, the Government is working out ways so that workers of industries will get sector specific minimum wages. 5. Government has already enhanced minimum pension for EPFO members and every pensioner gets minimum pension of Rs.1000/- per month perpetually. 6. Labour laws reforms will be based on tripartite consultations as already stated by the Prime Minister. The States are also being advised to follow the tripartite process. 7. For strict adherence to labour law enforcement, advisory has been issued to the State/UT Governments and strict monitoring has been initiated by Central Government. 8. For employment generation Mudra Yojana, Make in India, Skill India and National Career Service Portal initiatives have been taken. 9. Abolition of interviews for all primary jobs which do not require any special knowledge/expertise, is being done for transparency and expediting the process of recruitment. 10. Inflation is lowest in the last many years excepting two items onion and pulses. Government is taking necessary steps to contain the higher prices of these two commodities also. It was further clarified that there is no ban on filling up of vacancies in Government jobs and all concerned Departments are taking necessary action to fill-up these vacancies. It was further assured that the Government is committed to job security, wages security and social security to the workers. The issue of equal wages for equal work for contract workers is an issue requiring wider consultations and a committee will be constituted, if required. 1.MMS cadre re-structuring almost finalised. 2.Driver recruitment rule for Gr-1,Gr-2 and Gr-3 approved by law ministry.Hindi translation pending. 3. PA/SA recruitment investingation is going on. It may take time to arrive at a decision. SG FNPO met Chief PMG and PMG(MM)﻿of West Bengal Circle on 26/08/2015. SGFNPO addressed P-4 CWC meeting at Kolkatta on 25/08/2015. காலதாமத படுத்த அரசு விரும்புகிறதா ? 4 மாதம் தாராளமாக தரும் அரசு எதை உணர்த்துகிறது ? கால தாமதபடுத்த அரசே விரும்புகிறதா ? The Union Cabinet on Wednesday extended the deadline for the Seventh Pay Commission to submit its recommendations by four months. Earlier, it was reported that the commission, headed by Justice AK Mathur, had sought one-month extension of the deadline. Appointed by the then UPA government in February 2014, the commission was given 18 months to submit its report. The time allotted for the commission was to expire this month. The finance ministry estimates the central government's salary bill to rise by nearly 16% to Rs 1.16 lakh crore in the next financial year 2016-17 with the implementation of the recommendations of the Seventh Pay Commission. The pay commission is likely to recommend hike in government employees' salaries by nearly 40%, according to an analyst at global brokerage firm Credit Suisse. An official of the commission had said that the recommendations "need to be effective from 1 January 2016, or by April 2016 at the latest". "It will be the government's prerogative when to implement it. But beyond 1 January 2016, there will be arrears. But then, the government will be subject to criticism. Earlier, they had hidden behind Pay Commissions giving late reports," he had said. மத்திய அரசின் தொழிலாளர் எதிர்ப்பு கொள்கைக்கு எதிராக அனைத்து தேசிய தொழிற்சங்ககள் மற்றும் நமது சம்மேளனத்தின் அறைகூவலின் படி நடைபெறும் செப்டம்பர் 2 ஒருநாள் அடையாள வேலைநிறுத்தத்தில் பங்கேற்க தமிழ்மாநில சங்கம் வேண்டுகிறது. இது அரசின் தவறான கொள்கை எதிராக தேசிய தொழிலாளர் நலன் சார்ந்த வேலைநிறுத்தம். அதற்காக நமது துறை தலைவரிடம் 17 இம் தேதி ஒரு வேலைநிறுத்த கடிதம் கொடுத்துள்ளோம். எனவே நாமும் செப்டம்பர் 2 அன்று நடைபெறும் வேலை நிறுத்த போராட்டத்தில் 100% பங்கேற்று முழு வெற்றி பெற அயராது பாடுபட வேண்டுகிறோம். குறிப்பாக நமது FNPO தோழர்கள் அனைவரையும் பங்குபெற செய்ய வேண்டுகிறோம். உங்களின் மேலான ஒத்துழைப்பும் ஆதரவும் இல்லாமல் நாம் செப்டம்பர் 2 - 2015 அன்று வேலை நிறுத்த போராட்டத்தை வெற்றிகரமாக நடத்த முடியாது என்பதை நாம் அறிவோம். ஆகையால் நாம் அனைவரும் ஒன்றுபட்டு வேலைநிறுத்தத்தில் பங்குபெற்று வெற்றிபெற செய்ய நம்முடைய தமிழ்மாநில சங்கம் உங்களிடம் அன்புடன் வேண்டுகிறது. குறிப்பு நமது தமிழ் மாநில சங்கம் சார்பில் போராட்ட சுற்றறிக்கை வெளியிடப்பட்டு உங்களுக்கு அனுப்பப்பட்டுள்ளது. உடனே போராட்ட பணியில் ஈடுபட வேண்டுகிறோம். நமது சகோதர சங்கங்களுடன் இணைந்து உடனடியாக வேண்டுகிறோம். Secretary General's appeal to all Secretaries for our future survival. You are aware that our Federation and its affiliated unions have issued strike notice on 17-8-2015 to participate in the 2nd September 2015 strike called by national trade union centres. Our Federation is aware how our sister unions targeted our members during verification. We received hundreds of complaints from various corners complaining about the sister unions and their atrocities. The Federation is very well aware about the local issues. But we have to think globally and act locally. This is the time to go on strike at the national level. If we choose to stay away from strike on the pretext of local animosity, we will be branded as anti-strikers sister unions are expert to propagate against us in this regard. Majority of innocent members always believe false propaganda of sister unions. We should not give room to them, We mentally satisfied with the demands which are placed by the national trade union centres, especially item No. 5 Minimum wage as Rs. 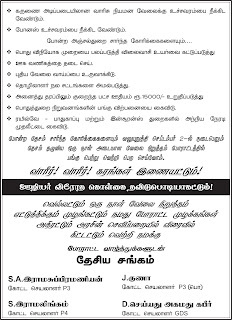 15000/- for Indian worker. Unless minimum wage is raised, we cannot demand Rs. 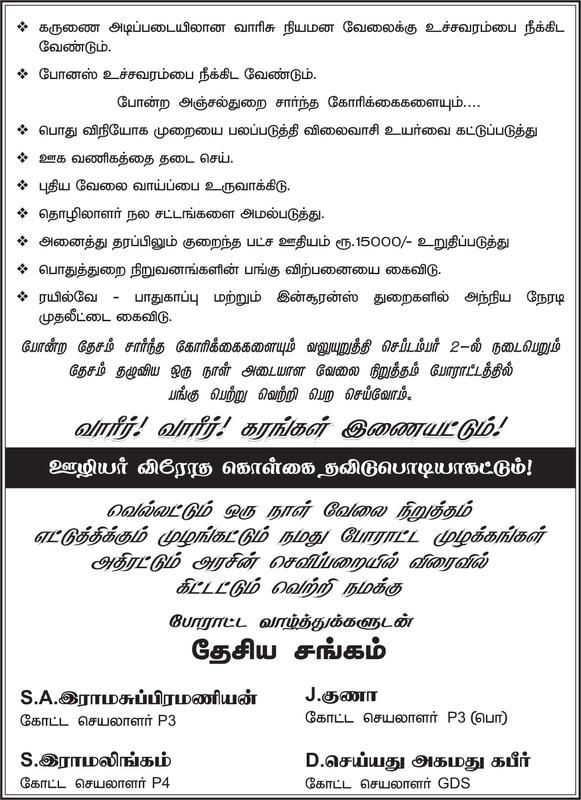 26000/- raise for Central Government employees. Like-wise, disinvestment, FDI and anti-labour laws are very important for indian Workers today. In regard to Part II now 7th CPC is going to submit its report in August/September 2015. But till date inclusion of GDS case in the 7th CPC purview has been rejected by the Government twice. This is unfair, unethical and unjust and we cannot accept the stand of the Government/Department. The Department/Government is always showing step-motherly treatment to the GDS employees. In Railways, Income Tax Department Central Secretariat and other Central Government establishment, Cadre Restructuring has already been implemented. But in our Department it is still pending including MMS. This is the time to show our anger against the Government/Department. Our Federation therefore requests all our colleagues to go on strike on 2nd September 2015. If the strike becomes successful, it will pave way for settling many issues across the table. Internet banking is the easy and most convenient way to transact- anytime, anyplace, at your convenience. Department of Posts offers Internet Banking services to the customers as a part of Core-banking solution. 2. I don't have a computer. Can I use DoP internet banking services? 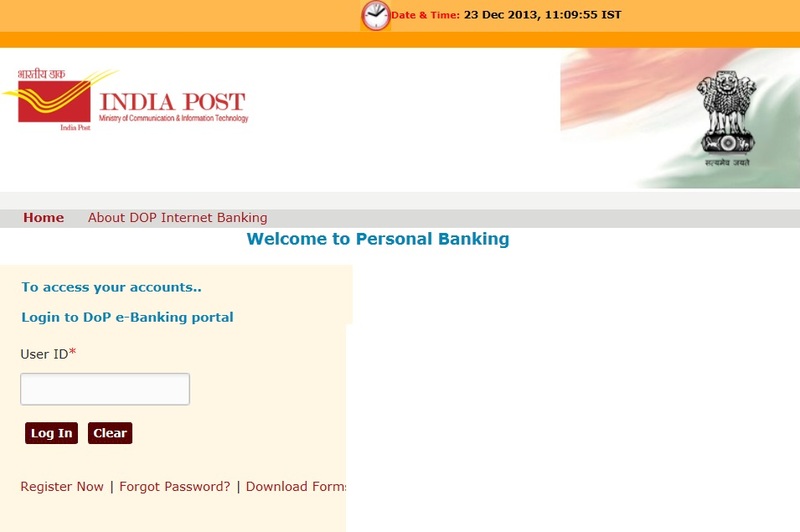 You can access DoP internet banking portal from any computer that has internet connectivity. Please make sure that the computer is Malware free. Avoid using internet banking portal at Cyber Café. 3. 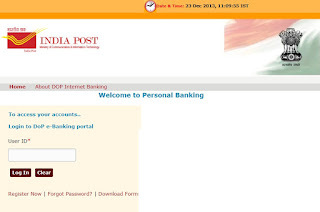 What are the procedures to access DoP internet banking? First of all you need to have an account at a Post office. You also need to register for the Internet banking service with the Post office. 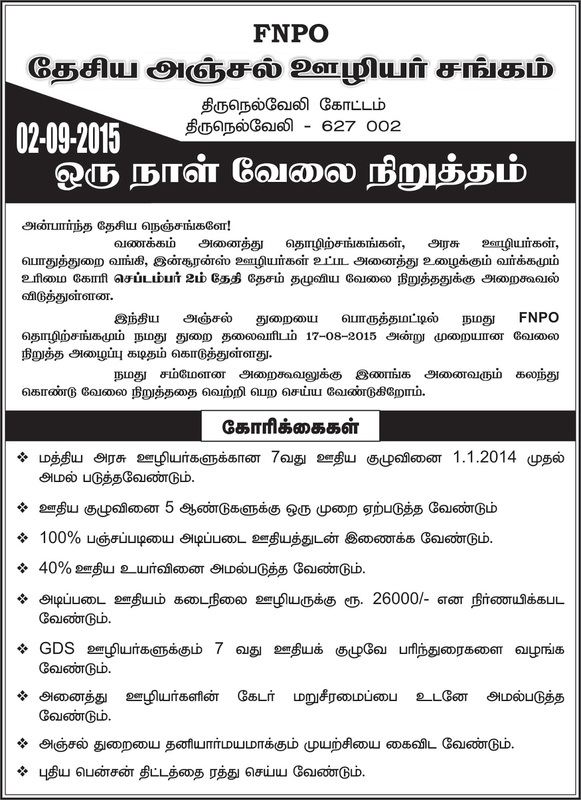 The PO branch will collect your application request for DoP internet banking and will be processed in 10 working days. You may need to visit your Post office for collecting your login credentials. During the first login, you need to go through a simple initialization process. 4. I do not have an account with Post office. What should I do? You are welcome to open it now. It is very easy to open an account in Post office. Please visit any nearest Post office which is migrated into CBS network and open the account. Avail our facilities once you open an account. 5. I want to register for Internet Banking. What do I do? Visit the Post office where you have opened the account. Our officials will guide you with the formalities. 6. Why are the user name and password so cryptic? The user name and password are system generated. We have no control over this process. During your first visit to DoP Internet Banking Portal, you must mandatorily change your user name and password. 7. Can I change the user name and password that were assigned to me? Yes. It is mandatory for you to change the system generated user name and password when you first logon to DoP Internet Banking Portal. Later at any point of time, you can change your password but not the user name. If needed, user name can be changed but only once. 8. Can I change my password? Passwords can be changed any time and any number of times. In fact we recommend that your password should be changed periodically to secure access to your account information. 9. What are the good practices for creating a password? You are requested to select a word that is not available in an English Dictionary. Do not assign your name, your family or vehicle number as your password as it can be easily guessed. Please commit your password to memory. Do not write it down or paste it somewhere. 10. What happens if I forget my logon password? Click on the 'Forgot password' link in the site and provide the requested information. A new password will be sent to your registered email address. 11. What happens if I forget my Internet banking username? If you forget the Internet banking user name, contact your Post office branch and re-register yourself. 12. I am unable to login with the user name and password assigned to me. What should I do? The user name and password are cryptic in nature because they are system generated and are case sensitive. When you are typing the user name and password for the first time, ensure that you type the characters as they appear in the document sent to you. If you still encounter problems, log a complaint in the "Complaints" link in the login page or contact your Post office branch immediately. 13. I want to know more about Post office and its services. We are glad about the interest you have evinced. Please log in www.indiapost.gov.in for more details or contact the nearest Post office branch. Please contact your Post office branch for further queries on Internet Banking services offered by Department of Posts.